Isn't it a lot of work? Isn't it cramped with dogs always underfoot? Some people don't get it. Our dogs make our lives better. They shower us with unconditional love. They protect our family and our home while we're away. They help reinforce our healthy routines, and encourage us to get out of the house and go on adventures. Setting up your tiny home for living in harmony with dogs can take some thought. Fortunately, we have lots of tips. You're going to need dog bowls. We like to use a dishwasher safe stainless bowl with a rubber bottom to prevent scooting. If your dog is prone to eating too fast, a slow feeder bowl or slow feeder mat can help prevent upset stomachs. 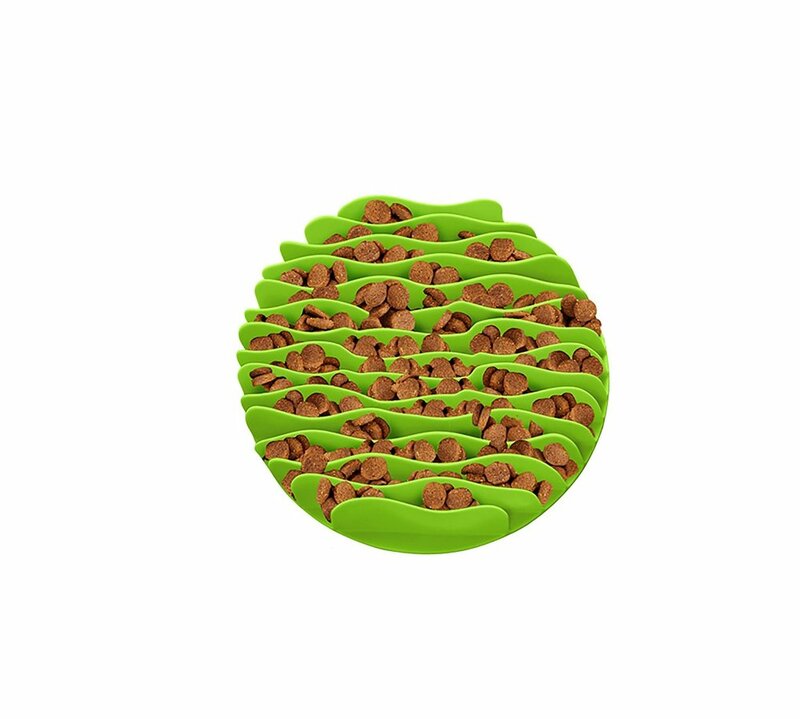 If your dog splashes a lot when she drinks, the Slopper Stopper water bowl does the trick for dry floors. It keeps your dog's nose in a small hole while she's drinking, so she can't splash water out of the bowl, and it slows her drinking a bit if she's prone to gulping water. If she has big jowls, your dog might still drip a bit of water on the floor when she's finished, but not nearly as much as with a regular bowl. For long car trips and hikes, a dog water dispenser bottle is great for keeping your pup hydrated. Walks are good for your dog, and for you. We like to use a hands-free leash for long walks and hikes. If you have a dog who is prone to pulling or bolting after fuzzy creatures, a hands-free leash can keep your arm in its socket where it belongs. For walking two dogs at the same time, a second hands-free leash clipped to the same belt swivel will give both dogs lots of freedom and keep the leashes from getting tangled. Alternatively, use a leash coupler if you want to keep your pups a little more tightly contained. The two leash method is better for a leisurely stroll, and a leash coupler is better for running. Keep a bag dispenser attached to every leash, so you never find yourself without a bag when you need one. On long hikes, I like to tie a loop into the dog bag and clip it to the dog end of the leash. I figure, she's a big girl, she can carry her own ... uh ... stuff. Harnesses are a much better restraining system for dogs than collars. Collars are for tags, harnesses are for leashes. If your dog tends to pull on the leash, a harness with a front clip is a good interim solution while you work on correcting the behavior. It's much harder for him to pull if the leash is attached to his chest, since pulling just turns him around. We like these harnesses with strong, padded straps, reflective stitching, and both a front and top attachment point. If a front harness doesn't do the trick, there's no need to resort to medieval or modern torture devices. The gentle leader will do the trick. We keep a set of dog shoes for each of our dogs. We never fail to get comments on our dog shoes while hiking. Everyone thinks it's adorable. But we don't use them because they're so stylish. Aside from being handy to keep dog feet clean when it's muddy, sturdy dog shoes offer real protection for paw pads. When hiking all day on a rocky trail, on hot pavement, or somewhere there might be broken glass, our dogs wear shoes to protect their pads. A paw pad injury can be debilitating for an active dog, so it's best to protect their feet when injury is more likely, or where help could be miles away. It will take a few minutes for your dog to get used to wearing shoes, but once they realize that shoes mean long walks, most dogs will be happy to wear them. While hiking, we also carry a small first aid pack including a roll of Vetrap self-adhering tape, gauze, and some Neosporin. Vetrap is great for covering small injuries on dogs (and people), since it's strong, relatively comfortable, and chew-resistant. When you get back from a walk, it helps to wipe your dog's feet before coming in the house. Tracking in just a little dirt can make a big mess in a small space, so it's worth the extra step past a good dirt and mud trapping door mat. Disposable dog paw wipes are available, but we find that keeping a towel by the door works just as well. For extra cleaning power, keep a refillable spray bottle with a dilute solution of biodegradable dog shampoo with your dog towel, and spritz the towel before cleaning your dog's paws. If it's nice outside and your dog wants to lounge in the grass, but you don't have a fenced area and your dog can't be off-leash, you'll need a tie-out. A 25 foot cable tie-out is a good choice for most dogs, since it's a manageable size and gives your pup plenty of room to roam. If you don't have anything sturdy to attach the tie-out to, a heavy duty dome stake is a good bet for all but the largest dogs. Screw type anchors are more portable and will work well for small or less energetic dogs, but medium or large dogs who are prone to pulling or chasing will rip a screw type anchor out of the ground fairly easily. I don't normally put clothes on my dogs, but coats can be useful. If you have a nervous dog, an anti-anxiety coat can sometimes make him feel better. Anti-anxiety coats can help dogs deal with separation anxiety, fear of loud noises, and discomfort with traveling. Thermal dog coats can be a good option to keep your dog warm in cold weather. If you have to wear a coat or huddle under a blanket, your dog probably needs some help keeping warm, too. Be sure to keep your dog's license or rabies tag on your dog's collar along with a phone number where you can be reached. So many people fail to put their contact information on their dog's collar, which makes it difficult to get lost dogs back home. For extra security consider getting your dog chipped, especially if you ever travel with your dog. If you're traveling across any borders, keep a folder with a copy of your dog's vet records, especially vaccination records. During tick season, your dogs need tick medicine. Do yourself a favor and spring for the once a month Nexgard chewable tick medicine. We've tried the topical stuff, and it's messy and doesn't work very well. Nexgard costs twice as much, but it works a hundred times better. Ticks simply do not want to bite our dogs. The only downside of Nexgard (aside from the price) is that any ticks that do get on the dogs will jump ship once inside the house. We keep a set of tweezers and a lighter around to dispose of any loose ticks we find. Lots of dogs will periodically develop ear infections. Dog ear canals are enormous and open, so it's pretty common for yeast or bacteria to take hold, especially with floppy-eared dogs whose ear canals tend to stay moist. We keep a bottle of Zymox Otic enzymatic ear treatment around for when one of our pups is having an ear problem. It's pretty easy to tell when her ear is bothering her. She'll shake her head a lot and scratch at her ear. The ear might be hot to the touch, red, bleeding from repeated scratching, smell bad, or have black gunk inside. Treating her ear with Zymox once a day for a week almost always clears up the infection, and often makes her feel better right away. It's gotten to the point where our dog will ask for her ear medicine when she needs it, just like she's asking for a toy or her dinner. If your dog is having ear trouble and you haven't tried Zymox yet, you have to try it. It's really amazing stuff. Keeping your dog's claws trimmed is essential for their health, but can be a difficult experience for your dog. 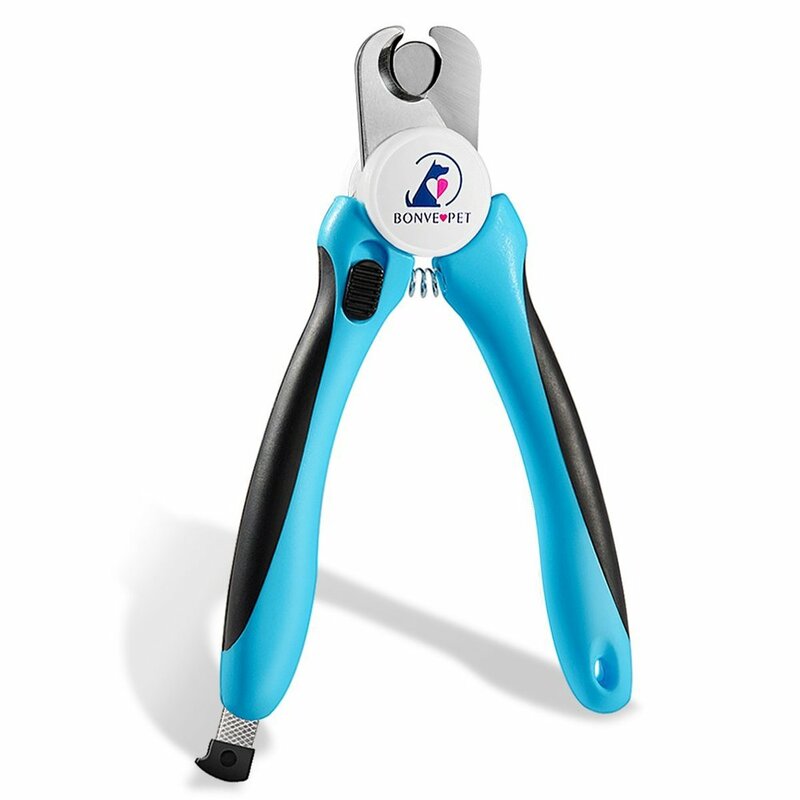 Using a set of dog nail clippers, you need to trim off the excess tip of the claw without cutting into the quick. Mistakes can be painful and bloody, so dogs are usually apprehensive about getting their nails trimmed. We find that if one person offers a spoon covered in peanut butter to our dog while the other trims her nails, she'll finish the peanut butter about the same time as her nails are done, and she will hardly notice the trimming. Another strategy is to use a nail grinder instead of a cutting tool, which is somewhat less likely to cut painfully into the quick. Regularly brushing your dog can help keep his skin and coat healthy and clean, and can also minimize the amount of fuzz on your furniture. Use a slicker brush for after the bath, de-tangling, and general coat maintenance. For shedding, the FURminator is an incredibly useful brush. It gives each hair a moderately firm tug, which helps remove any loose hair. Be sure to get the long or short hair model depending on your dog's coat. For annual shedding dogs with thick coats, I prefer to use my undercoat rake to remove last year's Winter coat, since it's much gentler on the coat than the FURminator, but still manages to remove the undercoat in clumps. I've made good friends with more than a few dogs by getting rid of their hot, itchy undercoat for them. For dogs with very short hair, a rubber curry brush is best, since other brush styles don't grab short hairs as well. Dogs need baths about once a month, and I prefer to do them outside (weather permitting). Use a biodegradable dog wash, a bucket of warm water, and a wash cloth. If you have the option to add one, having an outdoor shower in your tiny home is very handy for dog baths. Our outdoor shower is just a hot and cold outdoor spigot that we've attached a handheld shower wand to. Dogs don't absolutely need a spot of their own, but they will appreciate it if you have the room. Dogs are den animals, so a washable dog bed under a table or a desk is a good choice for a dog apartment. Keep an airtight treat container stocked with healthy dog treats. Our pups are partial to the these soft steak treats that are often on sale at Target. The key to a well behaved dog is lots of positive reinforcement, so don't hesitate to treat her and tell her she's a good girl every time she does something right. As a special treat, I've never met a dog who doesn't love a good pizzle. If you find you're feeding your dog too many calories with treats, just switch to smaller training treats. Using lots of very small treats in conjunction with a clicker is a fantastic way to teach your dog tons of words incredibly fast. The clicker is a perfect communication tool for removing ambiguity from training. The click tells your dog, "Yes, you just did exactly what I wanted at that exact instant! You get a treat!" Dogs need to chew. It's important for their dental health and general sanity, and giving them something they can chew helps them avoid chewing your shoes instead. We found that antler chews tended to last a lot longer than regular bones. But once we adopted Bailey, a serious chewer who could make an antler disappear in a day, we find that nylon dog chews were the best chewing investment. The heavy duty nylon withstands weeks of heavy chewing, doesn't splinter, and is mixed with tasty food-grade ingredients to make chewing extra rewarding. Treat dispensing busy toys like the Busy Buddy Barnacle offer your pups some stimulation when they're home alone, or just antsy. Be careful with using treat dispensing toys while you're not at home if you have multiple dogs who are food aggressive. Even if there are enough treat dispensers to go around, they can be the source of conflict when "I don't want THAT one, I want the one SHE has." The right food is important, not just for the health of your dog, but for controlling ... odors. When we adopted Bailey, she was eating Purina Pro Plan, and frankly, she was a pungent gas machine. As we transitioned her to Blue Buffalo, the gas went away almost entirely, and her poops got significantly less pungent as well. When you have dogs, fuzz happens. And when you live in a small space, the fuzz gets concentrated into a small area, so you generally need to clean up daily. Fortunately, cleaning up a tiny house doesn't take long. We use a cordless Dyson vacuum for cleaning our living space, which does a fantastic job at picking up pet hair from our furniture and all corners of our home. Some reviewers complain that the battery doesn't last long enough to clean their whole house with the cordless Dyson, but those people have a lot more house than we do. Another trick for removing pet hair from upholstery is to wipe it off with your hand while wearing a rubber dish glove. The hair tends to grip the glove, so you can sweep hair off upholstery in clumps. It's also a good idea to keep easily washable blankets on your furniture where your dogs like to sit. Rotate the blankets each time you do laundry, and you'll keep your furniture fresh and clean. To keep pet dander and dust to a minimum, we keep a small HEPA filter running whenever we can. This one has an optional 12V car kit we use to power it directly with our 12V house battery, and it also has a carbon filter to remove VOCs. The power draw to run the fan is pretty low, and taking care of our indoor air quality in our small space is worthwhile. Have a Pinterest board to save this article for later? Check out that handy Pinterest-friendly graphic at the top of the page. Most of the links on this page are affiliate links, so if you purchase something based on our recommendation, we might earn a small commission for referring you, and it doesn't cost you any extra.